The MDR-V900 is an around-the-ear professional headphone that is ideal for sound monitoring in recording studios, radio, film production, video and virtually any application where high quality sound is required. The over-the-ear design follows the natural shape of the human ear, and positions the driver unit at a correct distance from the ear canal and creates a sealed resonance chamber. well i got mine just now, and from hearing with it some dif' styles, and dif' audio formats on my pc, i have to say that they are not the best thing u could get, but they r ok though, they are too light on the head, the ear units are very comfortable and big, from a small test iv done with my hands, they seem to be good for recording from the sealed acpect, they fold to a small size, and overall they are a nice, comffy, and sounding good, FOR A ONE DAY EXP' WITH THEM. None for my specific applications. I think people forget that headphones are really close quarters speakers to the extent that component matching, like full size speakers, is critical. For example, my AKG 701 sound best with tube amplification and certain drive tubes. My Sennheiser HD-650 seem to sound best with solid state equipment. There is no one particular headphone that will sound its best with all sources. Now with the Sony MDR-V600HD headphones, I was looking for a very comfortable, great sounding headphone, closed so as to avoid disturbing others as well as sealing outside noise, resonably priced, and specifically low impedence to run off battery powered portable Walkman Cassette, Sony & Panasonic CD players, and various MP3 players that came my way without the bulk of an added portable headphone amplifier. To those ends, these headphones are outstanding for a variety of reasons. The coiled cord doesn't get all tangled and I don't end up snagging it on things like chairs in a caffeteria or tripping on.it. Yet, if I need for cord, it expands quite easily. With high end sources, I would say these sounded more analytical than musical and lacked the expansiveness of the 701 for example, but this observation came before a lengthy break-in period. However, with portable sources right out of the box, the V900's sounded great. Overall I think they're outstanding considering looks, comfort, sound, and durability. I would advise people to run these at moderate to high volume for at least 100-200 hours before making any decisions on the sound quality. I think you'll find after a suitable break in period, the highs smooth out considerably and there is more of a seamless integration with the mids. Also, the bass becomes cleaner and more effortless, meaning, great bass at lower listening levels. After break-in, the V900's were much more musical, yet they still retain the sparkle and all the details some audiophiles enjoy listening for. I think they're great for work because you can get a very high end sound with a very small compliment of equipment and keep your music habit very low key. I use these mostly with a Sony Walkman WM-FS497 am/fm stereo cassette, and occassionally with a Sony TC-D5 Professional portable stereo player. I would an online audio retailed who specialized in nothing but high end and custom ear cushion and headband replacements for all sorts of headphones. Sennheiser HD-650, AKG 701, assorted other portable headsets. I love the sound quality, as a radio personality it is a must that I can hear myself with total clarity. However they need strengthen the cord, and make the ear pieces stronger. I find myself buying a new pair every year because the cord wears out or the ear piece breaks. Excellent Volume and Excellent Sound at LOUD Volume! These Love Loud Music, Alternative, Rock, Trance. They can be driven LOUD with low power portables. Absolutely Excellent sounding on mini-IPOD, no distorion, even with EQs! They DO have an excellent frequency response but notice Weaknesses below. If you love to play your music Loud, or have IPOD, buy these, they wont dissapoint with their power handling! Shure E2C distorts, Sony EX70LP distorts, IPOD earbuds distort. Dominant Bass in 70-80Hz range - FLAT, not enough extension, it's as if you're missing a SubWoofer in your system. Rather Mono sounding in vocal range at all but full volume. Treble slightly flat at below full volume. What's Good ? Whats Bad ? Or Best Summed up as WHAT WENT WRONG!? Simply put ... put your ear right next to your loudspeaker, a good one hopefully, turn it up mildly, and listen ... this is what the SONY V900s' sound like. If you've done this, you'd notice overpowering bass, rather powerful, but flat muddy vocal mid range, and slightly harsh treble. Now, move away from the speaker, and the sound is balanced, deep, open, with good response and stereo seperation. If you take the Sony V900s off your ears, set them down, it's the same effect, the crisp, detailed and airy treble appears, nicely laid back vocals, and decent bass. Your first impression of these headphones should be : "FLAT" These are really hard NOT TO RECOMMEND, since they sweep the floor when it comes to loud listening, and at the same time, after you get used to their sound, you can enjoy listening at normal sound levels for very long periods of time, partially due to their excellent comfort. Although, it's not lond before you grab the VOLUME knob and put them to the max. BASS!, detail in music...keep in mind I have never put on a set of Sennheiser or Grado headphones though (that will change soon). As a previous reviewer mentioned, it does sometimes sound like you are listening to music in a tunnel or while ever-so-slightly muffled, although overall frequency response and sensitivity is great. I don't want to give off the wrong impression; these headphones do sound very good; it's just that they have a bit too much bass for me when listening to music and for $135 I think I could have gotten a more worthwhile upgrade in sound (which is while I'll be purchasing Grados and/or Sennheisers shortly). First, let me say that I am not an "audiophile". I've never used a headphone amp and I don't know exactly what to look for in an expensive set of headphones, but I do know what does and does not sound good to me. 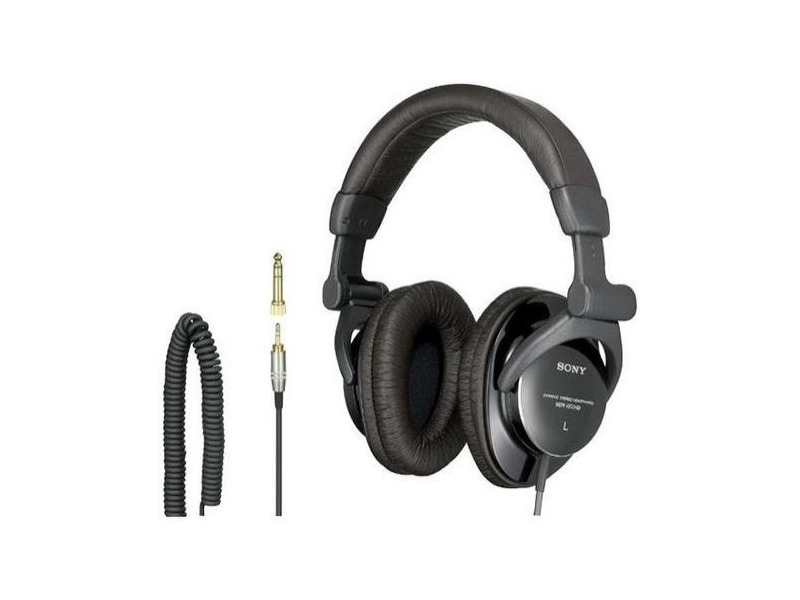 I purchased the Sony MDR-V900's after reading the user reviews on audioreview.com, although I had originally set out to buy a set of Sennheiser or Grado headphones. Let it suffice at this point to say, I *kind* of wish I had bought some Grados. That's not to say that these Sony headphones are bad, by any means, but as one reviewer pointed out, they do heavily color the bass and although that's what I thought I wanted at first, I am now wondering if I have made a $135 mistake. You see, I have a set of cheap(?) Takstar headphones that came with an old PC sound card that I purchased, and they do a decent job keeping up with the $135 Sony MDR-V900's. They do lack quite a bit of bass, and a bit of detail, but otherwise I can't tell a huge difference. Keep in mind I'm not an audiophile here, but I do have a pretty discerning ear...and I feel as if I've spent $135 for very little benefit. I honestly wish I had bought a pair of Grado SR80's or Sennheiser 280 Pro's instead. Not that the Sony's are bad by any means; it's just that they do emphasize the bass heavily and do not have as much detail as I expected. Maybe my Takstars were that good, but I expected an enourmous upgrade by buying the Sony's and they have left me semi-disappointed. Trust me, that's the LAST thing I wanted to write, as I wanted to justify my purchase...and these headphones would be GREAT for someone who wanted great sound with emphasis on bass and minimal distortion...but I found myself listening to my Takstars and wondering if the $135 was worth the extra bass and detail. In conclusion, I think that I can spend $80 on a set of Grado SR-80's and get extremely accurate/detailed sound and still have good bass response, and save over $50. These Sony's DO do an excellent job of containing the sound (I'm listening to them now) but the extra bass just seems a bit unnatural after listening to the Takstar headphones. Keep in mind, the Takstars have a module that accepts 2 AA batteries and accentuates the bass, similar to a Panasonic "Bass Shaker" model that's currently available, and I actually bought the Sony MDR-V900 with computer video games in mind where extra bass would be desirable, but after listening to several MP3's it just seems unnatural. Truth be known, I don't even use the inline bass-accentuating module on the Takstars anymore; I just plug them into my Logitech Z-680's and kick back. These 'phones really do color heavily the bass and it disappoints me that I want to send them back, because I REALLY thought I'd like them and I really wanted to recommend them. However, I think I will end up purchasing a set of Grado SR-80 headphones as well as a set of Sennheiser headphones (perhaps the 280 Pro's) as I feel after reading the numerous user reviews that they will deliver an accurate sound as well as ample, accurate bass response. I really really wanted to like and recommend these MDR-V900's, and I can to those who favor a heavy bass accent when listening to their music, but to me the bass accent provided by the 50mm drivers is just too heavy and does not sound as accurate as the original recording intended. For those that listen to rock/R&B/rap and play video games, these 'phones may be perfect, but for me they just didn't provide as much of an upgrade from my Takstar headphones as I had imagined/anticipated. I honestly bought them because I thought I would love the increased bass, but after wearing them through a few songs I wish I had gone with a lesser model (perhaps a model with 40mm drivers instead of 50mm; the increased bass was just slightly too much on most music for *MY* preferences). Your mileage may vary; some people may love the increased bass...but I will be returning these because I regret spending $143 for more bass and slightly more detail than my Takstar headphones. Strong clear response throught entire range. Closed design blocks virtually all outside noise. Very Comfortable. Not suited to high end monitoring applications. I will first preface by saying that this is the first pair of quality headphones I have purchased above the under $50 variety, but I have used and listened to other high end units. These headphones are in my opinion an incredible bargain in their price range. Everything I have listened to is reproduced with incredible vibrance and realism. The sound quality is simply superb. And there is no distorsion even at high levels. Others have complained about the bass. I don't think they are in the right market for these phones. The bass does have a little extra punch but it is not excessive. So if you want 100% accurate bass reproduction, look elsewhere. Do not use these for studio monitoring, or to produce a cd. That's not what they are designed for. On the other hand, if you are looking for a nice sound for general listening purposes that is not weak in the low end, this product would work nicely. The highs are of course crystal clear, unlike what you get with most of the low end stuff. I also love the closed design. It blocks out any outside noise, even better than some noise cancalling headphones I have used. You can turn on speakers playing something at a very loud volume a short distance away, put these on and play something else, and you will hear nothing from the outside. I can't count the number of phone calls I have missed while listening on these. The design is also as comfortable as I've ever used. You can listen for hours and almost forget you even have them on. I also purchased these for durability. I have only had them several months and already they have endured some very rough use without any problems at all. I look forward to many more years of enjoyable use with these headphones and I recommend them to anyone looking for a general use, high quality design. I have used these headphones in many situations from critical and casual listening to mixing on HD recorder. They are incredibly accurate. I find that they are an excellent value. I have ised them for 3-4 hours at a time when recording without fatigue. Even after 8 years, they sound better than anything I'm testing. I was impressed by Grado's 80, tempted by Senn's HD25, but there's always something I miss compared to the V900. Load, clear highs, strong and accurate bass, comfortable and closed. Will let you know if I find something better.. Adds huge punch in the low end. My comparision is directly against the Sony MDR-3000 Digital Reference Headphones on an album I have listened to in the 1000s of times, a CD I've been producing for 3 years. I can guarantee that the MDR-V900s colors very heavily in the bass, so much so that it sometimes hurts. If you are not looking for a reference monitoring headphone but rather something that might add some kick to your tunes, that's where the strength of these phones lies. If you are looking for accuracy, your money will be better spent on something more high end. - Very comfortable - Virtually impossible to distort even at very high volume levels - Wonderful sound - Very well designed to prevent sound leakage and outside noises - Metal plug. I got these headphones not very long ago. Yet, I am pretty satisfied with them. There are a couple of things I noticed right away. First, these headphones have folding design, so it makes them compact and it looks like its not easy to break (I checked, they are really durable). Second thing that I noticed first time I put them on is how comfortable they are, and that is: very comfortable. Some people said that they are too heavy, headphones are heavier than all of the ones I used in years but the only time I notice that weight is when I'm holding them. They also do not tend to slide off your head (that has been a problem with all other headphones I used). Third is the sound quality. It is virtually impossible to get these headphones to distort. Base, midrange and highs are very clear. Sometimes the base gets too aggressive, but it depends on your equipment as well. Besides, as the other person mentioned, it can be tampered with an equalizer that I do have on my CD player. Now, there are three other things left to mention. First is volume, Before I used to listen to songs on my CD player at volume often being at 6/8 and 8/8 for some CDs and I have used regular, not monitor headphones, now I rarely raise it above four (4). Second is sound leakage. I was amazed how well these headphones perform. If you take headphones off and put your system to a much higher level and then push one headphone to another, you will hear nothing unless you hold these cans about 2cm from your ear! Insulation from outside noises is very good too, but if you keep the volume on lower levels you can still hear then someone starts talking to you (not what they say, just the voice), so they don't have to yell to attract your attention. At last I have to say a couple of words about the coiled cord. Some find it annoying, but I found it very convenient. The cord itself is thick enough to not to break and coils are streched very easily, so if you happened to have a clip from one of the computer headsets (plantronics for example) to clip it to the shird or even jeans etc then you won't feel any tension and you don't have to untangle the cord every time you have to plug them in after they have been put away. So the bottom line is, if you have the money, and if open headphones are not an option then MDR-V900 are the headphones to go for, all the way! A lot of cheap SONYs, technics monitor headphones, cheaper panasonics, AIWAs, others.